SPECIAL CONTAINMENT PROCEDURES: SCP-1562 requires a large amount of open space, absolutely no less than six by six kilometers (6 km. x 6 km.). When confined in tighter spaces, specimen must be classified at Keter level. It has great difficulty passing over asphalt; recommended containment procedure requires a large, closed-in series of streets. Both an outer and inner square of roads is required as an added layer of protection. The outer square should be one (1) kilometer around the inner square. Tracking the specimen is very difficult due to its advanced speeds, and so an adequate asphalt perimeter is to be constructed around the area from which 3██ of the 348 reports have come, near the southeastern end of ████████, at coordinates 54°█′█″N 2°█′█″W. The organism does not attempt to flee out of containment unless it is (a) not given enough room to run or (b) approached by a human at a proximity closer than five (5) meters. Every day at 12:30:00, a standard issue vehicle, Foundation Model AR-6 “Explorer,” containing two (2) agents is to navigate the perimeter of the containment facility until SCP-1562 is observed. After each of these patrols, a Class C amnesiac is to be distributed to all passengers in the vehicle. In the event that the specimen is not located, SEE PROTOCOL MI-1562-YELLOW. Further containment attempts for up-close research have yet to be attempted, and are scheduled for [DATA WITHHELD] at 18:30:00, [DATA WITHHELD] at 20:15:00, and [DATA WITHHELD] at 10:45:00. Further attempt deemed unnecessary after successful second recontainment attempt. NOTES: SCP-1562 released back into original containment preserve. DESCRIPTION: SCP-1562 is a narrow-bodied, quadrupedal humanoid. It was first formally reported in [REDACTED], England, Great Britain on July 14, 19██. This initial report was filed due to the death of a certain Mr. ████████, who was terminated in a fatal car accident attributed to SCP-1562. His corpse was never recovered from the wreckage, and is presumed destroyed in the accident. 347 reports surfaced following initial publication of SCP-1562’s discovery. All 348 reports are in the process of investigation and suppression. SCP-1562 is most commonly reported by children aged thirteen (13) and under, and is often dismissed as an extension of prepubescent imagination. This makes containment and study of the specimen a problem of high concern. For more information, see Protocol MI-1562-GREEN. The specimen is known to follow cars, running as fast as sixty (60) kilometers per hour in order to remain even with the road. Its speed is matched by its leaping ability: it is recorded to be able to jump as high as fifteen (15) meters and as far as twenty-one (21) meters without a break in pace. 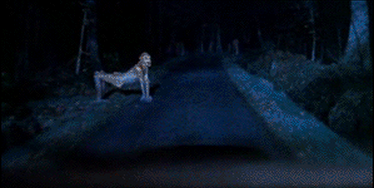 The creature will only follow the car so long as it maintains eye contact with a passenger; once eye contact is achieved, the passenger finds him/herself unable to willingly break it. An imprint of the humanoid is left in the victim’s mind, and will resurface, often violently, during repeated car trips. SCP-1562 uses this method to mark the individuals with which it has shared eye contact, and is much more likely to be seen again by someone who has already encountered it. Dr. ████████ hypothesizes that each new encounter of SCP-1562 is in fact an encounter with an entirely new creature, bred from the memory stamp on the victim’s brain. SCP-1562’s extremities appear to have been sawed off 12.7 centimeters above the wrist and 17.78 centimeters above the ankle. The missing appendages have been replaced with iron claws set at eighty-degree angles from the amputations. These claws aid SCP-1562 in mobility. It is as yet unknown as to whether or not this, or the several other operations found throughout the creature’s anatomy, was self-performed, voluntary, or forced. It is able to reverse the direction of movement for both knees and both elbows using what appears to be manufactured machinery in place of the synovial joints. NOTE: It is unknown whether observed specimens SCP-1652-B and SCP-1562-C also feature these mechanical anomalies. SCP-1562’s head is roughly conical in shape. A tapetum lucidum tissue behind the retina, is used to divert the attention of car passengers and drivers to the creature. A third, considerably smaller eye on the crest of its head allows the creature to avoid oncoming obstacles. Its narrow skull is fused to the top with its spine at a distinct and precise ninety-degree angle. Further inspection of the creature’s anatomy show that this joint too has been replaced with machinery that allows the creature to have its head turned either exactly to the right or left at all times.